Elise graduated from Northeastern University in 2015, where she earned her Bachelors in Rehabilitation Science and Doctorate of Physical Therapy. Throughout her co-op and clinical experiences, she has worked with a variety of patient populations in different settings, including inpatient rehabilitation services and outpatient sports injury rehab. 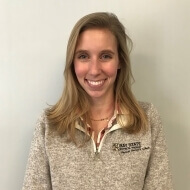 Elise enjoys working with patients of all ages and has a great interest in orthopedics, manual therapy, and aquatic therapy. After taking a graduate course on vestibular therapy while at Northeastern, Elise has since attended continuing education courses about vertigo and concussion syndrome to keep up to date with her diagnosing and treatment skills and techniques for this patient population. Elise was a competitive swimmer for 13 years and was classically trained as a singer, later competing in national competitions with her Northeastern a’capella group. When not at work, she enjoys visiting the different beaches along the South Shore and learning how to cook.